A customized digital signal processor first analyzes, then enhances your music's bass frequencies in real time. This audio signal is then turned into intensified sound via state-of-the-art neodymium drivers. Just press the BassUp button and prepare yourself for power. Flare is the first speaker to utilize the all-new Soundcore app; simple-but-powerful software that allows complete customization of Flare's sound and lights via smartphone or tablet. Soundcore's Anker heritage offers world-renowned power management technology. Enjoy almost 250 songs from a single charge and make sure the party never ends early-if you can keep dancing Flare can keep playing. Beat-Driven Light Show: A halo of LEDs react and phase in time with the beat-5 color themes and 5 illumination patterns can be customized via the Soundcore app. 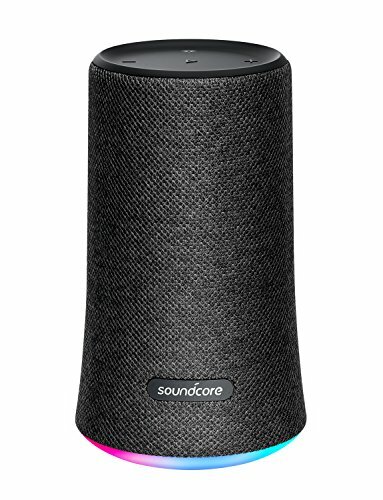 If you have any questions about this product by Soundcore, contact us by completing and submitting the form below. If you are looking for a specif part number, please include it with your message.